Cheras has A LOT of good eats we would really love to explore, if not for the distance away and jam from our house. This kopitiam is very nearby the steamed tilapia specialty restaurant (KTL) and Cheras Leisure Mall. They're famous for their authentic, old recipe Penang Prawn Mee. 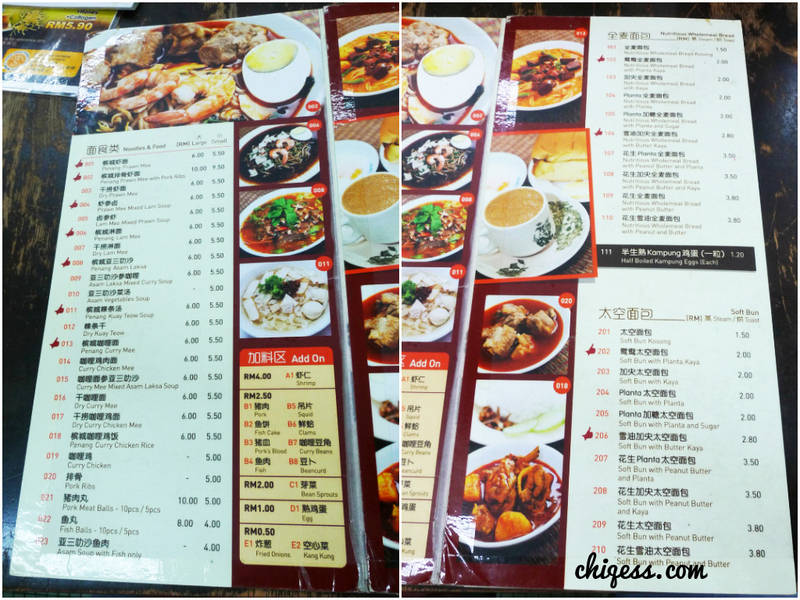 The menu has quite an extensive list of Penang hawker fare. Besides their famous Penang Prawn Mee, there's also Lam Mee, Assam Laksa, Soup and dry curry mee, Kuay Teow soup for noodles. The Bun selection list is quite long too! Prices for noodles are mostly RM5.50 for small and RM6 for big, with options for add-ons. Portion size is decent and amount of soup/extra liu given is generous, so I think it's quite worth it! The soup was really hearty and served piping hot (very important for me!). I liked both the level of spiciness and sourness of the soup, but I find the soup not as thick to my liking. The fish did not appear fishy and the vegetables were fairly fresh. Taste-wise it was very appetizing and I would love to order it again. There was a generous portion of noodles with loads of shredded pork, half an egg, and some de-shelled prawns. The soup is amazing. Very sweet and tasty! Overwhelmingly good with the porky and fried prawn shells base. I also like how they give a lot of soup!! Hard to find shops which give adequate amount of served soup. Somehow they're always just so stingy. Our add-on! The additional pork ribs (RM5). These were very soft - the meat fell off the bone easily. I'm not much of a meat person, but I do like pork ribs hehe. 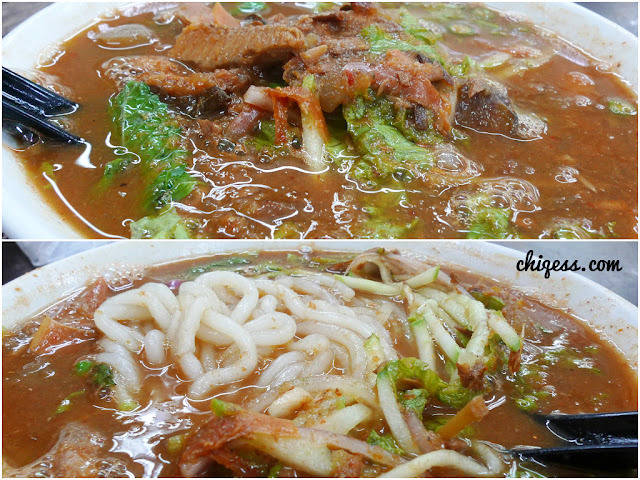 Dear uncle was feeling a bit peckish, so he ordered their Dry Curry Mee (RM5.50). In it were brown sotong, kerang (blood cockles) and some curry long beans and lots of fried shallots. In overall, I think Auntie Lora Kopitiam has really good hawker fare and lived up to our expectations.